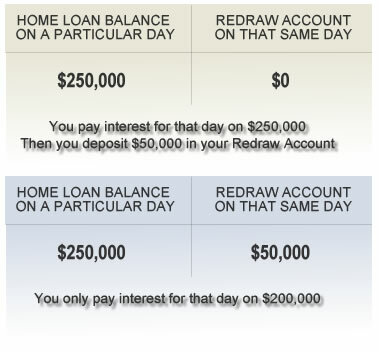 Your 100% Offset Redraw Account account is a fully transactional account. 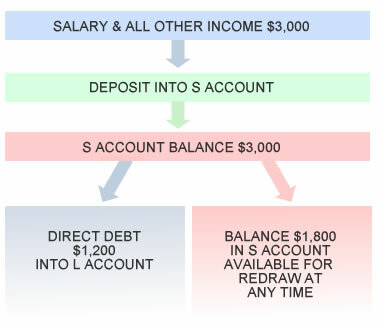 What is a 100% offset re-draw account? Your entire income (salaries, rents, and other monies) are paid into your 100% Offset Redraw Account instead of making extra payments into your home loan. You retain immediate access to your funds. Living expenses can be withdrawn from this account, BUT pay as many of your day-to-day living expenses and purchases as possible with a credit card. Leave your salary in your account for as long as possible. This maximises the length of time your funds are generating your 100% Offset Redraw Account benefit. The interest is calculated on a daily basis!!! (Charged monthly in arrears). All interest rates, fees, charges, terms & conditions quoted are indicative only and subject to change without notice. This is a sub-account of the loan, not a separate facility. This is the transactional account. The debit card is only attached to the S Account. Salary is deposited into the S Account. The minimum payment is taken as an internal direct debit from the S Account to pay the L Account. This allows additional funds to be accessible for redraw at anytime. The Direct Debit will be set up against the L Account because there are no additional funds available to redraw from the S Account. This is set up exactly the same as salary crediting. Funds are deposited into the S Account and the minimum payment is taken as an internal direct debit from the L Account to pay the S Account.